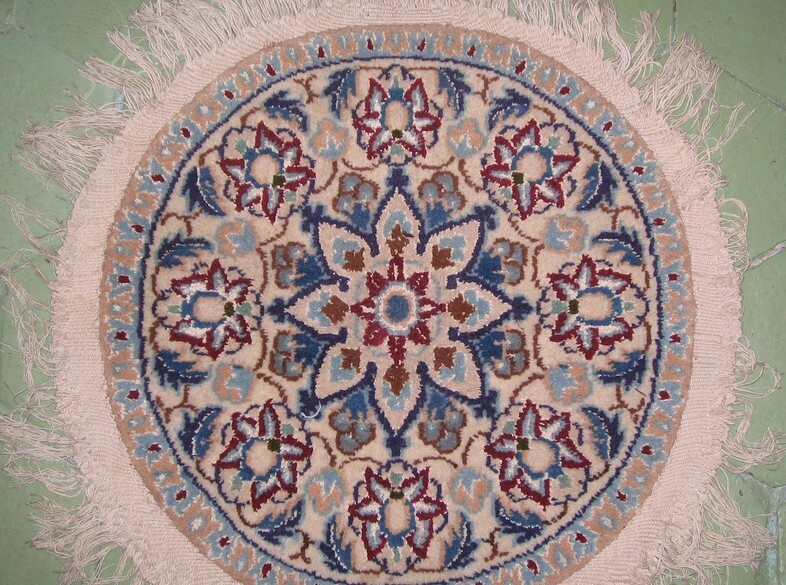 THE JOSHAGHAN RUG - Single center diamond-shaped medallion surrounded by a symmetrical design. The tiny Iranian town of Joshaghan is one of the oldest continuously operating rug-making centers in all of Iran. Its lineage stretches unbroken to the 17th century, when it first became a significant rug-making center of the Safavid Empire. At that time, court manufacturers employed Joshaghan’s abundance of local weavers to make the extraordinary carpets they then transported to urban centers for use in royal courts. The antiques of this era are some of the finest Persian carpets in the world, and the Joshaghan tradition then established has continued through the centuries. That this remote and unassuming town could ever have established itself as a major royal production center may come as something as a surprise, but the explanation for the area’s early success is a matter of historic location: set in thinly-populated Varganeh Valley on the then-vital trade road from Isfahan to Kashan, Joshaghan had been a cheap and convenient stopping point for 17th century merchants traveling between Iran's major cultural and economic centers. On one end, Isfahan had served as the seat of the monarchy; on the other, Kashan served as a resort in times of leisure. From its beginnings to its contemporary examples, Joshaghan rugs have remained remarkably consistent in style and construction over the centuries. Even when compared with Iranian village rugs known for strict adherence to tradition, Joshaghans stand out for how little they vary from the standard model. For this reason, experts can often spot these unique carpets simply by looking at weave and pattern. In the typical pattern, a single center diamond-shaped medallion will be surrounded by a symmetrical geometric design (often orchids). This comprises the field of the rug, which is in turn framed by a geometric border, often in the popular Herati style. As for the weave, the standard Joshaghan rug is somewhat coarse, and its wool pile (tied with Persian knots) can be comparatively loosely packed. Still, the underlying structure of the Joshaghan rug is famously tough. The thick cotton warp is incredibly durable, derived from the area’s tribal weaving traditions. Thus there is a combination of fine design and utilitarian execution that give Joshaghan rugs a certain rustic appeal, a quality that often distinguishes village carpets of Iran. The color palette of Joshaghan rugs has also remained virtually unchanged from Safavid times. It is defined by high-contrasts: richly saturated red backgrounds and deep primary blue motifs. Whites, oranges, and yellows sometimes figure in as well, but typically as accents to Joshaghan’s powerful blues and reds. 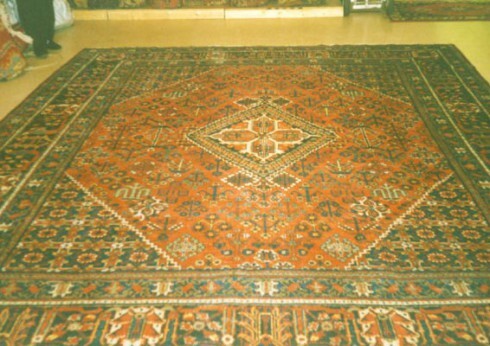 Today, antique Joshaghan rugs are some of the most well known examples of Persian carpet design. Older carpets are museum pieces--not only are they some of the finest Persian rugs ever made, but they represent an important link in the history of Persian carpet making. They can be found on display in major textile collections from Tehran to London. As for contemporary rugs, the area does continue production, though in drastically reduced numbers. As with its heyday, the explanation has to do with location: Joshaghan, once at the heart of Safavid trade routes, is now bypassed by roads running between the major cities Isfahan and Tehran. So the town carries on its tradition slowly, its modern rugs bearing striking resemblance to the originals: in pattern, materials, and weave they have managed to hardly change at all. Thus, one of the oldest traditions in Persian rug-making continues unbroken.